Book Now - To better serve our customers, we have created a new online software called Book Now. We apologize for any issues that arise while we are implementing this new feature of our business. 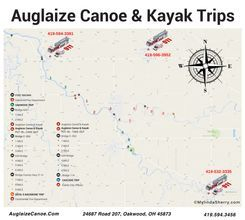 If you encounter any problems with Book Now, please contact us, Mylinda or Auglaize Canoe via Facebook. Thank you for your patience! WE CAN BOOK FOR YOU! Contact us "WE CAN BOOK FOR YOU!"